Apples are the sweetheart of fall. From apple pie to candy apples, this fruit can add tartness and sweet flavor to any meal. 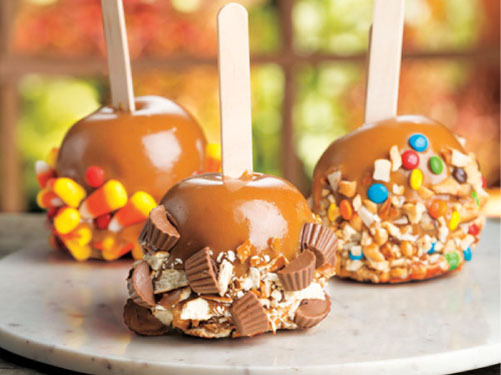 Perfect for Halloween, visit our recipe for Homemade Caramel Apples. If there’s any vegetable that deserves praise, it’s this gem of the cruciferous family. Tasty and versatile, they pack a punch and really shine this time of year. Roast halved Brussels sprouts, quartered small onions and halved carrots at 375°F for 30 minutes then toss with just-cooked pasta, a splash of balsamic vinegar and crumbled feta cheese. A member of the squash family, zucchinis peak in late summer, but they are still abundant in the fall for flavorful breads, side dishes and salads. Make Zucchini Cakes for a delicious breakfast. It’s pumpkin-flavored everything come fall – get these in our Produce Department for more than just jack-o’-lanterns. Toss pumpkin seeds with light butter and salt, layer on a baking sheet and bake at 300°F for about 45 minutes or until golden brown for a delicious fall snack. In the fall, mushroom varieties such as chanterelles and oysters are harvested. These woodsy-flavored vegetables are great in soups, stir-frys and more. For a more unique application – add them to meatballs! Try our Mushroom Meatball recipe. This broccoli-cousin is in its heyday right now. Cauliflower is extremely versatile… oven-roast, serve with a cheese sauce or use it to make a low carb alternative to mashed potatoes. Steam one head of cauliflower until tender, drain and discard excess water, add 3 tablespoons milk, 1 tablespoon butter, 2 tablespoons sour cream, salt and pepper, and then mash. You can even make a cauliflower pizza crust, especially for those who have celiac disease. Mostly eaten raw in crunchy salads, radishes are tasty root vegetables that can add color and a sweet flavor to many meals. During fall, try pickling them! Pack radish rounds into a pint-sized canning jar, prepare a brine recipe, pour it over the radishes, and then cover and refrigerate. This starchy, tuberous root vegetable is a fall staple. They’re typically served roasted with sweet complementary ingredients like honey, butter and pecans. To make a simple baked sweet potato, prick the potato 2 to 3 times with a fork and then place it directly on the oven rack in the middle of the oven. Without preheating, cook at 425°F for 45 minutes. The arrival of crisp fall weather means it’s harvest time for colorful and tasty winter squash. Some of the most popular and versatile varieties of squash include acorn, butternut, delicata, golden nugget and spaghetti. Try our recipe for Couscous with Butternut Squash & Pine Nuts. A fruit that is coveted for its natural antioxidants and super sweet berry flavor, millions of pounds of cranberries are harvested every fall. Put them in pies and other baked goods, make cranberry jelly, or use them to make a relish! Mix 4 cups of cranberries and 1/2 cup of sugar in a food processor, then toss with 2/3 cup each of diced celery, apple and chopped parsley for a relish like no other!